SYDNEY, AUSTRALIA--(Marketwire - December 19, 2008) - Hotel comparison search engine HotelsCombined.com (http://www.hotelscombined.com) has released statistics on the effects of anti-government protestors blockading Bangkok airports on hotel operators in Thailand. The research was conducted by calculating the number of daily reservation requests to Thailand by global travellers. It is clear that the political instability in Thailand is negatively influencing travellers' decision making with prospective travellers seeking substitute travel plans. 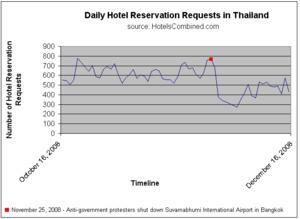 The flow-on effect to hotel operators in Thailand is loss of room revenue in the period of peak tourist season. This, coupled with the global financial turmoil, may well put the Thailand travel industry into crisis mode. Nonetheless, hotel operators who seek contingency plans such as working closely with online travel agents to advertise attractive hotel deals are able to soften the decline in activity caused by the current political environment.